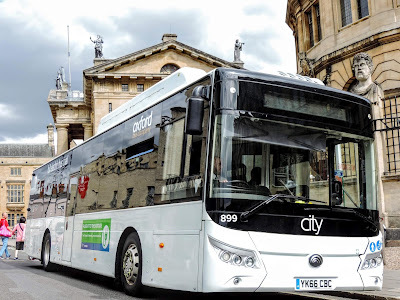 The Yutong E12 all-electric bus hit the streets of Oxford for the first time last week, however, transport bosses say there are still 'practical concerns' over plans to introduce a zero emissions zone (ZEZ) in the city centre by 2020. The comments from Oxford Bus Company boss Phil Southall come as the firm launched a two-week trial of the zero-emission, all-electric bus. Under current Oxford City Council and Oxfordshire County Council proposals, diesel and petrol vehicles would be banned from some streets in the city centre from 2020. As vehicle technology develops it is proposed the Zero Emissions Zone will extend to cover all non-electric vehicles across the city centre by 2035. The council has insisted the ZEZ should be introduced within the timescales as it looks to reduce illegally-high levels of toxic nitrogen dioxide, which contributes to diseases including cancer, asthma, stroke and heart disease. The bus to be used in the trial, currently the ‘best on the market’, according to Mr Southall, only has a range of 130 miles - more than 100 miles short of the daily bus routes on which it would be used. However, the trial will allow the company to gain a better understanding of battery life and performance and to gauge customer and driver feedback. He said: “This trial is an important part of the journey and will enable us and key stakeholders to better understand the technology, what the current standard is and better inform everyone involved in developing a strategy to deliver a greener future for the city of Oxford. However he said there would need to be major advancement in the technology in order to make the 2020 time frame feasible: “Based on the technology available today, the Zero Emission Zone as it is currently proposed is not realistic or practical. The single decker bus, developed by Chinese manufacturer Yutong Bus, emits zero tail pipe emissions and has no engine noise or vibration. The white single decker will operate for one week on services 3A and 6, with the first week of the trial being used to allow drivers to get used to the state-of-the-art vehicle, which is charged via a diesel generator at the Cowley depot. Leader of Oxford City Council, Susan Brown, said: “The trialling of the fully electric single-decker bus is another exciting step forward for Oxford, moving along the road to zero.